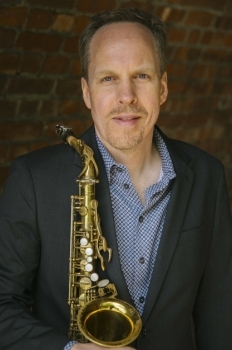 Saxophonist and composer Dave Anderson brings a significant musical voice to the New York jazz scene. Anderson has performed as a saxophonist around North America with notable musicians including Clark Terry, Matt Wilson, Craig Taborn, Chico Pinheiro, Nicholas Payton and Mel Torme. He is currently a member of percussionist Memo Acevedo’s global jazz group, Manhattan Bridges, holding residency at New York’s Zinc Bar. Although he plays in a modern style, Anderson has received accolades from jazz legends including Ray Brown and Rufus Reid. Increasingly Anderson has focused on composing original music for his bands such as Blue Innuendo, Melting Pot and The Dave Anderson Quartet. He has recorded over 30 of his original compositions while developing a highly personal compositional/instrumental sound – one that is harmonically complex, melodically compelling and rhythmically exciting, yet accessible and appealing to lay listeners. Dave Anderson was born in 1966 and raised in Cloquet, Minnesota. He signed up for the school band at the age of 11 and chose the saxophone. Soon after he began to play, his older brother began bringing home jazz records. Dave fell under their spell. Winning awards as an outstanding high school soloist at area jazz festivals, Dave matriculated at the University of Minnesota after graduation from Cloquet High School—earning his degree in psychology rather than music, but spending much of his time in the music department and playing in the university’s jazz bands and symphonic wind ensemble. He won a full scholarship to the Aspen Music Festival, where he performed in a student ensemble that also included Clarence Penn, Ryan Kisor, Scott Whitfield, and Laurence Hobgood. Once he was able to play again, Anderson woodshedded in a smaller scene than New York. In 2005 he moved to Seattle and began playing regularly. He also formed several working bands as vehicles for his original compositions; one of these, a quartet including Seattle pianist John Hansen and guest trumpeter Thomas Marriott, was featured on his 2010 debut album Clarity, a collection of eight originals and two lesser-known jazz covers. Anderson was already deeply immersed in the multiculturalism of New York’s music scene in early 2017, when the new Trump administration announced the first version of its infamous travel ban. It was the spark that lit a creative fire. Anderson assembled an octet to record five of his original compositions at Brooklyn’s Systems Two Recording Studios. The band and its new EP, both called Melting Pot, combine straight-ahead and Afro-Latin jazz with Indian ragas, as well as traditional Jewish and Mongolian influences, to create bewitching music that lives up to the band’s name. Read a profile of Dave Anderson in the Pine Journal. Listen to Dave's Prior Recordings and find/steam/purchase them online here. This modern groove album pits a sweeping set of original music vs. a familiar group format of tenor/soprano sax (Dave), guitar (Tom Guarna), organ (Pat Bianchi) & drums (Matt Wilson). The result is fresh, spontaneous and “in-the-pocket.” Listen on Spotify. This debut recording proves that jazz can be harmonically interesting, melodically intricate, and rhythmically hip – and still be totally accessible. These are fresh, new sounds – composed, arranged, and performed with clarity and directness. With Dave (soprano/alto saxes), John Hansen (piano), Chuck Kistler (bass), Adam Kessler (drums) and special guest Thomas Marriott (flugelhorn). Watch the Blue Innuendo band play "Urban Dilemma"
Sunday, March 24 - Dave Anderson Quartet featuring Dave Restivo with Paul Rushka & Joe Poole, Frankie’s Jazz Club, 765 Beatty St, Vancouver, Canada, from 8 PM (2 sets), $16 cover. Friday, April 5 - Memo Acevedo’s Manhattan Bridges Orchestra, Zinc bar, 82 W 3rd ST, Manhattan, 8pm-midnight, $20 cover. Wednesday, April 23 - Gary Morgan’s PanAmericana!, Baha'i Center, 53 East 11th St, Manhattan, 8pm-midnight, $20 cover. GET All DAVE's ORiginal music from the Blue Innuendo album <IN THIS DROPBOX FOLDER>. ENJOY, and SHARE FREELY FOR NONCOMMERCIAL USES!